As a sense of responsibility (“I have to do it!”) sparks a sense of confidence (“I can do it!”), LG U+ is now pushing passionately for one more great leap forward (“I want to do it!”). LG U+ anticipates many great things. Our specialized market services (e.g. Kid's World) and strategic alliance products (e.g. My Home A.I.) will provide a solid base upon which this progress will continue to grow. LG U+ is committed to solidifying its foothold as the home media market leader though more strategic partnerships, and is determined to produce as much success on IoT projects. Our goal at LG U+ is to provide services that exceed customer expectations. In addition, LG U+ is growing more equipped than ever to efficiently establish and facilitate 5G networks. The innovation of technology in the 5G era inspires us to create more diversified services that our customers can truly appreciate. It is our hope to become the next leader of Fourth Industrial Revolution fields with great planning and operation of drone, smart CCTV, AR, VR, and mobile IoT services. 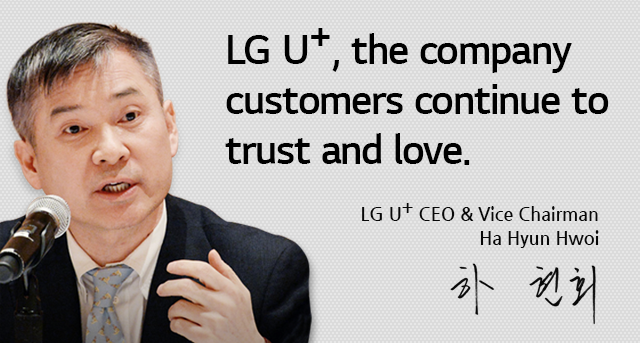 We are committed to becoming the best version of LG U+ that our customers can continue to trust and love.